Our content is relentlessly reviewed, and it's close enough to the real exam that you'll feel confident, prepared, and ready to pass VTNE®. 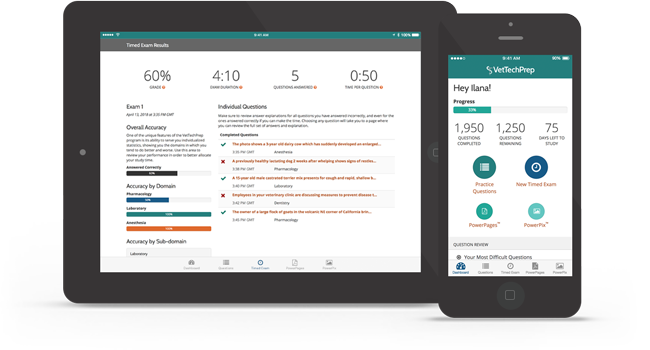 The question topics and user interface were carefully modeled after the VTNE®, meaning that you'll be accustomed to the timed test, and better able to gauge your ability to answer questions throughout a full exam. And to further get into exam mode, you can even strike through answer choices to narrow down your options. You can now prep for the VTNE® on your smartphone or tablet with our apps for iOS and Android. Take a few questions, review a couple of PowerPages or PowerPix, or sneak in a quick timed exam whenever and wherever you have a little time. 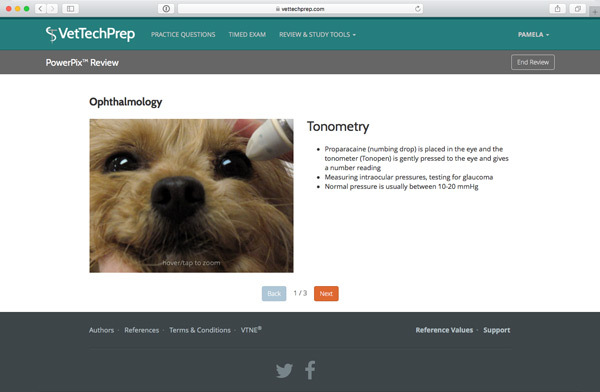 The app is available for free with every VetTechPrep subscription. PowerPix™ provides a great way to visually review case photos, medical conditions, instruments, and more in a flashcard-like format with notes on each image and the ability to zoom in on details. Choose from two modes: a Review mode that lets you choose a category and presents the notes alongside the image, or Quiz mode that randomly serves images, hiding the notes until you decide to view them. 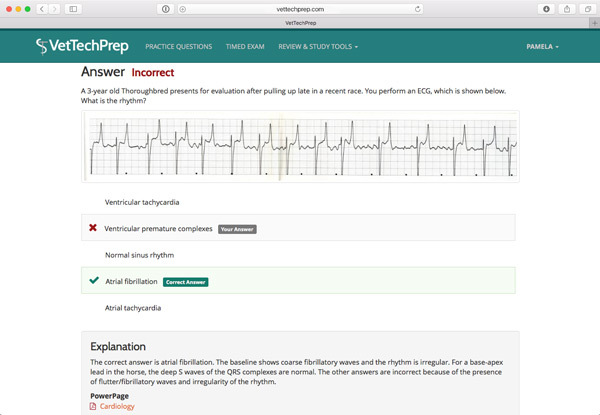 Detailed answer explanations are one of the most important learning tools in VetTechPrep. Instead of memorizing answers, the explanations help you better understand the concepts. Don't just learn which answer choice is the correct choice; learn why that answer is indeed the correct choice. No VTNE® exam questions will be identical to what you've studied, therefore comprehension is key to success on exam day. 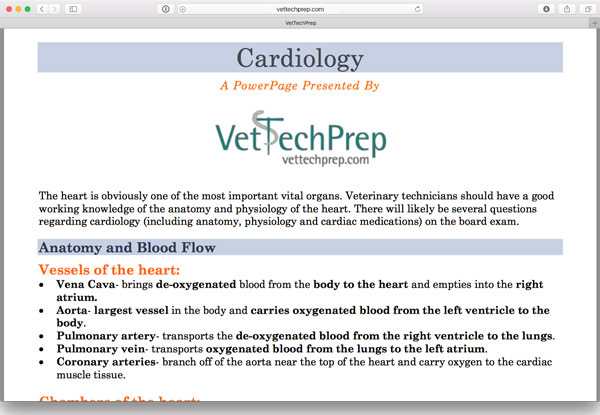 PowerPages™ are neatly packaged PDFs each focused on a single key vet tech topic. Each PowerPage™ is condensed to the main points on the subject for quick synopsis. They provide the equivalent of a summary and highlights for a topic specific lecture or review session. PowerPages™ are also linked to questions on the topic for easy accessibility when you need additional information to master the concept. Statistics and graphs allow you to track your performance granularly, helping you to more effectively allocate your study time. Statistics are broken down by category and subcategory enabling you to gauge your progress. This statistical information illustrates your strengths and weaknesses so you can make the most of your study time. Questions are carefully crafted and peer-reviewed by experts. Additionally, every question is written by a specialist in the field, reviewed by peers, and sent to a copy editor to ensure clinical accuracy and clarity. VetTechPrep Certified™ Content must go through a rigorous approval and review process before release. This is followed by continuous peer review as well as statistical item analysis to ensure validity, relevance, and accuracy. VetTechPrep Certified™ Content Contributors: VetTechPrep content contributors include preeminent veterinary specialists, experienced practitioners, as well as recent graduates to ensure that our content stays up-to-date and relevant. The characteristics shared by all content contributors are great writing skills and dedication to providing the very best veterinary technician exam review content. VetTechPrep Certified™ Content References: The references for VetTechPrep Certified™ content are trusted resources used by veterinary technician professionals. VetTechPrep Certified™ Content Approval: When new content is submitted for incorporation into the VetTechPrep learning module, it must undergo several layers of review and approval before it is made live at the website. A specialized portal was created for writers to submit questions, answer choices, and detailed answer explanations. Once complete, these are submitted for peer review. Peer review involves a panel of at least 3 additional veterinarians or veterinary technicians editing submitted content for accuracy, relevance, and level of detail. Only the best content is approved and then sent for editing by professional copyeditors who identify and fix typographical and other errors. The final layer of approval is veterinary or veterinary technician review of the fully-edited content at the VetTechPrep site. VetTechPrep Certified™ Content Ongoing Review: On an ongoing basis, veterinary technician specialists are invited to review the content in their area of expertise to ensure that it is appropriately thorough and accurate. They update any information that may have changed since the content was originally submitted. They then make additional contributions of new content in areas that they feel would benefit from additional coverage. That new content must go through the review process described above before becoming VetTechPrep Certified™ Content. 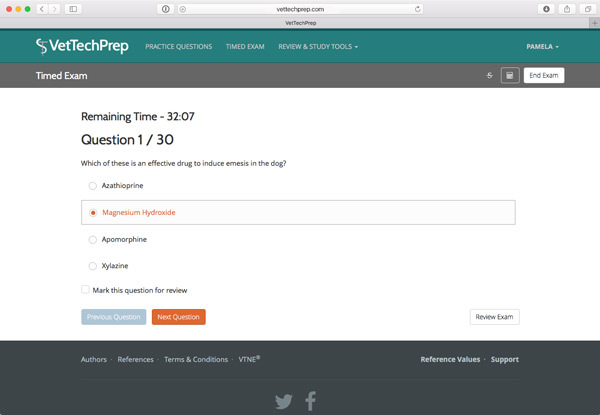 VetTechPrep Certified™ Content Item Analysis: On an intermittent basis, VetTechPrep has a statistician with expertise in curriculum assessment provide a statistical analysis of the VetTechPrep content. This involves a detailed analysis of user data for each question and answer choice, which allows identification of potential problems such as poor distracters, confusing questions, or other content issues. This data is utilized to perform targeted content review. 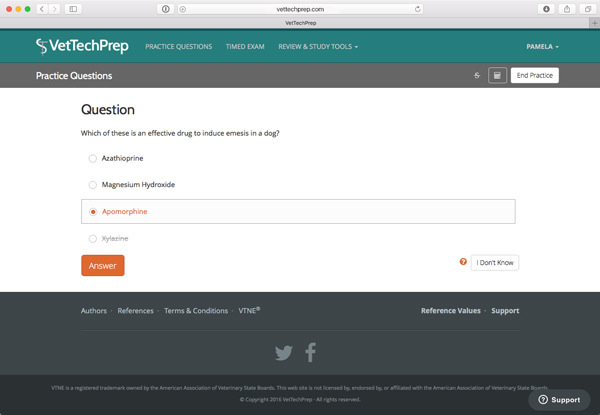 VetTechPrep Certified™ Content User-Triggered Review: Whenever a user contacts the VetTechPrep support team with a question about our content, this triggers review by an expert in the appropriate field. 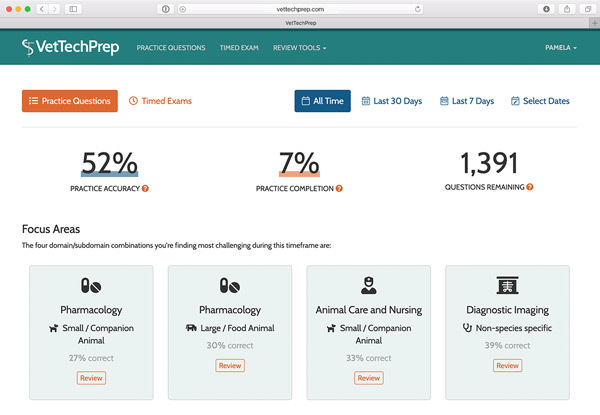 They not only respond to the user to clarify their question but can submit proposed modifications to existing VetTechPrep content in real-time for review and updating.